So then, the bungalow. It's a two bed brick built, cavity walled, bog-standard 60's bungalow, that has mostly been left alone apart from basic redecorating and the removal of one wall. The back of the bungalow and the garden are south/south-west facing, on a gentle slope, so are near perfect for catching the sun. A very skinny stray cat has taken up residence in the "sun room" (a rotten shed-like extension with windows) after apparently being left behind by some people who moved away from across the street. It's very friendly, which is nice, but clearly pretty ill too. If it's still alive by the time we move in (we give it food and water when we're up at the bungalow by way of helping that happen) it's unlikely it and our small yappy type dog will get along well, but they just have to cope with that. It's home will be disappearing at some point in any works too, but we'll cut it a hole in the shed so it can hang-out there instead. 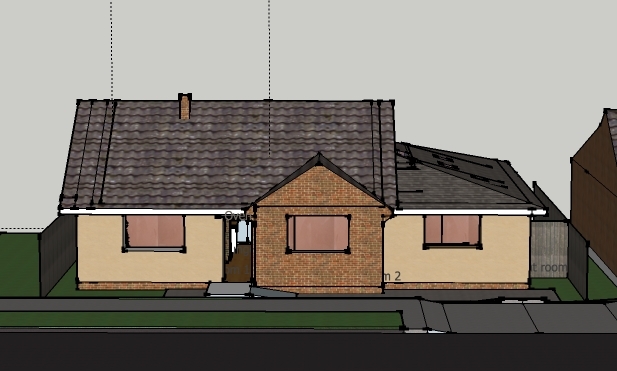 The plan is to super-insulate the existing bungalow by externally wrapping it in new strawbale walls which will sit tight against the outside walls, and build a strawbale extension. The image above is a guestimate of how it might look. My 3D design skills didn't exist before I started trying to design possible layouts so there are lots of errors in the model, and it's liable for wholesale change once our strawbale building designer gets going on it shortly (http://jakubwihan.com/) - but it gives a rough idea. I'll explain next time why the front bedroom that extends forward of the main building is left as brick. The main part of the building is what's already there, plus strawbale wrap and rebuilt roof - the roof needs to overhang the new bale walls by at least 450mm to minimise the amount of direct rain that falls on the wall. The lower section on the right is the extension, which is built in the space currently occupied by a small garage, the sun room, and at the rear a very small bit of the garden. This way we would only be increasing the footprint of the building by a very small amount whilst gaining lots of functional space. This is one of the big advantages of rejuvenating an existing building instead of starting from scratch - we won't have to break in virgin ground, which is both easier and hugely reduces the impact of the build. 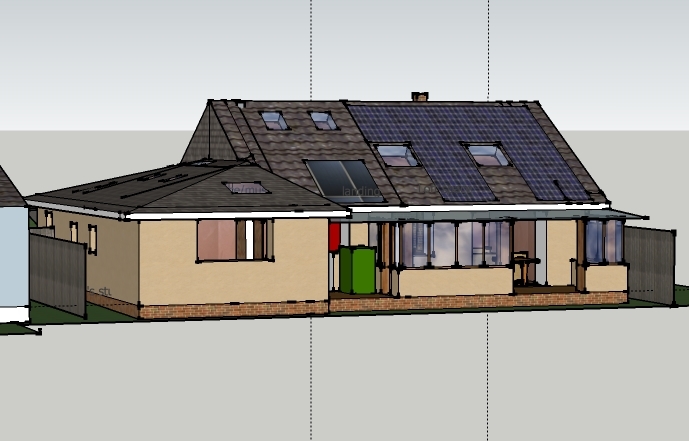 At the rear we hope to build a big conservatory (see rear view, below), to act as extra space in warm times and also maximise solar gain - the sun will heat the conservatory which in turn will give heat to the house. The space occupied by the planned conservatory is currently patio, so again the impact of building there will be minimal. The brick plinth foundations raise the straw walls at least 225mm from the ground, to cut-out splash-back onto the straw from rain hitting the ground. The foundations will be draining, so any water that finds its way in to the walls can get out again quickly (strawbale walls are apparently very resilient to this - it takes incredibly high levels of persistent humidity in the wall combined with heat before any kind of rot occurs - and careful attention to details of construction and design should ensure that no water gets in anyway). The inside wall of the foundations will also be insulated, to help avoid heat-loss through the floor and foundations. The roof will also be highly insulated, as will the floor, though we haven't worked out yet how the floor will be insulated. Probably we'll have to raise the height of all the doors so that the bungalow doesn't become suitable only for tiny people.